KATHMANDU, 28 April 2015 (IRIN) - Januka Chettri is living in a makeshift camp with relatives and neighbours. But that isn’t her main concern. Januka is worried about her nine-month-old daughter Asma, who has been sick ever since the 7.8-magnitude earthquake struck on Saturday. “There is no health clinic here and I cannot find any doctor to help,” Chettri told IRIN. More than 40 families are living hand-to-mouth in this one camp close to Tribhuvan International Airport, the only airport in Kathmandu. It is a communal existence: each shelter is temporary home to dozens of men, women and children. Government agencies, and local and international aid organisations appear initially overwhelmed by the scale of displacement as they mobilise a coordinated response effort. There are an estimated 1.6 million people temporarily displaced in Kathmandu, according to the Nepal Red Cross Society (NRCS). The picture outside the capital, including areas closest to the epicentre, is still unclear, as remote mountain villages have yet to be reached. The Nepalese government says it has identified 16 camps in the capital, but NGOs say the figure is actually in the hundreds. People have sought shelter wherever they can, on every available piece of open, flat ground, in every neighbourhood of the city. Damaged buildings are still vulnerable to aftershocks so survivors prefer to sleep out in the open. 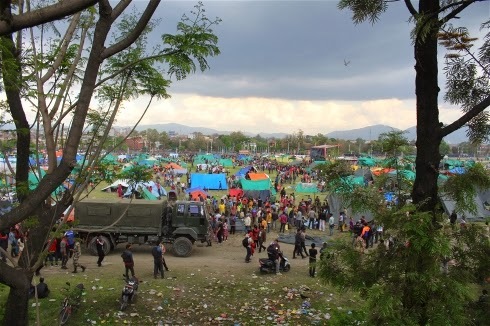 “There is genuine fear throughout the city and a lot of people still camping out in parks, playing fields and other flat areas under tarpaulins and suchlike because they’re frightened to return to their houses,” Mervyn Lee, a senior adviser with Mercy Corps who arrived in Kathmandu on Monday, told IRIN. As the true extent of the displacement around the capital emerges, so concerns about public health are rising. “There are urgent needs for safe drinking water, emergency toilets, hand-washing soap and ORS (oral rehydration solutions) in evacuation centres,” said Dharma Raj Pandey, head of the disaster unit for the NRCS. Lee said Mercy Corps had been concentrating its initial efforts on these informal camps, providing what he called “very simple items,” including hygiene kits and water. “We are very concerned about the hygiene and sanitation problems, but we are looking into it seriously,” Pradip Kumar Murali, a senior engineer from Nepal’s Department of Water Supply and Sanitation, told IRIN. Heavy rains have made matters worse, spreading the human waste that is accumulating in the camps in the absence of proper facilities. “We are now worried if there will be an epidemic because we can already see many children sick in our own camps,” Mahendra Sharma, a local social worker from the NGO Panchakanya Samaj, told IRIN. Help is on the way as a huge international aid effort kicks into gear. But that brings with it its own challenges in terms of coordination and logistics. For now, the aid can’t get to many hard-hit places because roads are blocked and some communities are only reachable by foot or helicopter. Mercy Corps’ Lee, who has 30 years’ experience working in Nepal, said the damage beyond Kathmandu was likely to be severe. “Helicopters are by far the best way to assess the damage in these remote areas, get casualties out and aid in,” he told IRIN. But poor weather has been hampering the aerial rescue and assessment effort. The information they have been able to gather when conditions have allowed has been predictably grim.